No, they don’t taste like dirt. Really. Beets are beautiful. 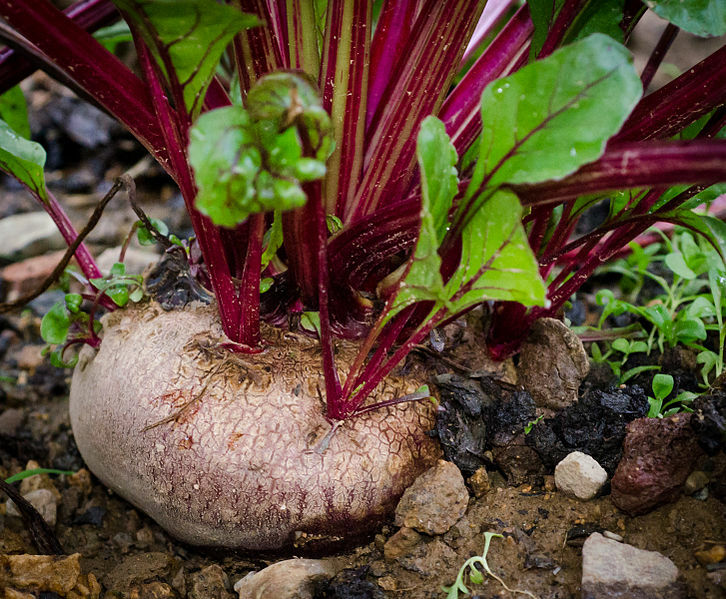 They’re packed with nutrition from root to leaves, including antioxidant and anti-inflammatory properties that aren’t found in more commonly consumed plant families. Use the greens as you would fresh spinach, collards, chard, or kale. They’re more delicately flavored than many greens and add welcome color to salads. 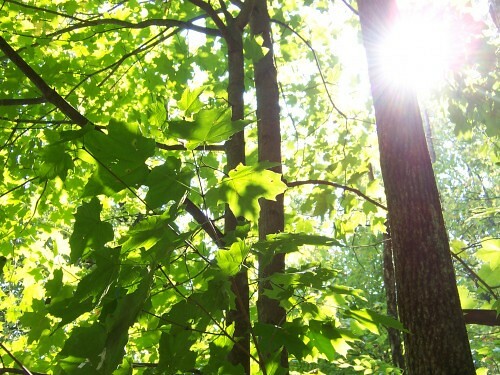 The roots, so dark and unpromising, shine with jewel-like color once the skin is removed. Use them in soups, salads, appetizers, smoothies, well, just about any way you can imagine. Here are a few unconventional suggestions. This bright concoction contains just enough beets to add lively color to your table. No one said you have to fess up about the ingredients. Process all ingredients in blender until smooth. Add a bit of the reserved pineapple juice if necessary to process. If more sweetness is desired, add additional honey to taste. If you choose to add the optional cream cheese or dairy, stir it in only slightly so it creates a swirl pattern. Serve with fresh pineapple wedges, apple slices, strawberries or other firm fruit. Or add as a pink schmear over cream cheese slathered bagels, toast, or muffins. The beets in this recipe turn cauliflower florets a lovely soft pink. Serve a few on top of a dark kale salad, alongside spicy ethnic food, next to a bright yellow omelet, wherever the color contrast makes for a pleasing culinary experience. They taste great and provide lots of probiotic goodness. Set out three quart mason jars (or a 3 quart fermenting container). Put equal amounts of cauliflower florets and beet pieces in each jar. To each jar, add 3 cloves of garlic, 1 bay leaf, a dash of dill or pickling spice, 2 pieces hot pepper, and 1/2 tablespoon pickling salt. Fill each jar with water to the rim. Weight the contents to keep all solids under the liquids and screw lids on loosely. Place the jars in a pie pan or other plate to catch any seepage. Leave the jars at room temperature for five to seven days, tasting occasionally. When it has reached the stage of pickling sourness you prefer, cap the jars more firmly and store in the refrigerator. 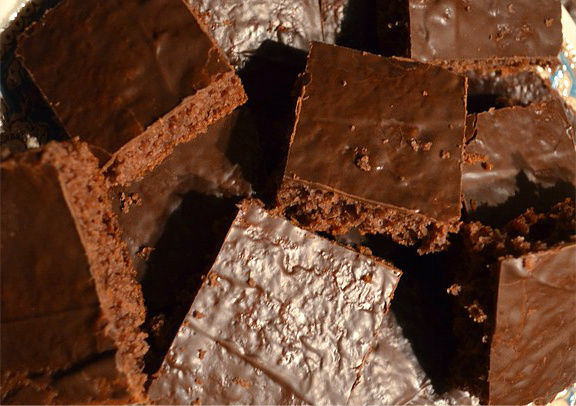 These brownies are a subversive way to add the fiber and nutrients of beets to dessert. Preheat oven to 350 and spray a 9 x 9 pan with nonstick cooking spray. Whisk together flour, cocoa, and sugar. Add bitter, beets, eggs, vanilla, and 1/2 cup chocolate chips—mixing after each addition until smooth. Flop batter into pan, spread evenly, and bake at 350 for about 20 minutes or until the center is somewhat firm to the touch. If you want them topped with chocolate, sprinkle the optional 3/4 cup of chocolate over the surface immediately after removing the pan from the oven. Cover the baking dish with a flat cookie sheet or tight covering of aluminum foil. Leave the cover in place for five minutes or so, then remove and spread the melted chocolate evenly over the brownies. Note: I toss a 1/2 cup of chopped beets (additional, because chopped beets take up more room in a measuring cup than pureed beets) in the blender with the eggs and melted butter. There’s no real recipe for this. 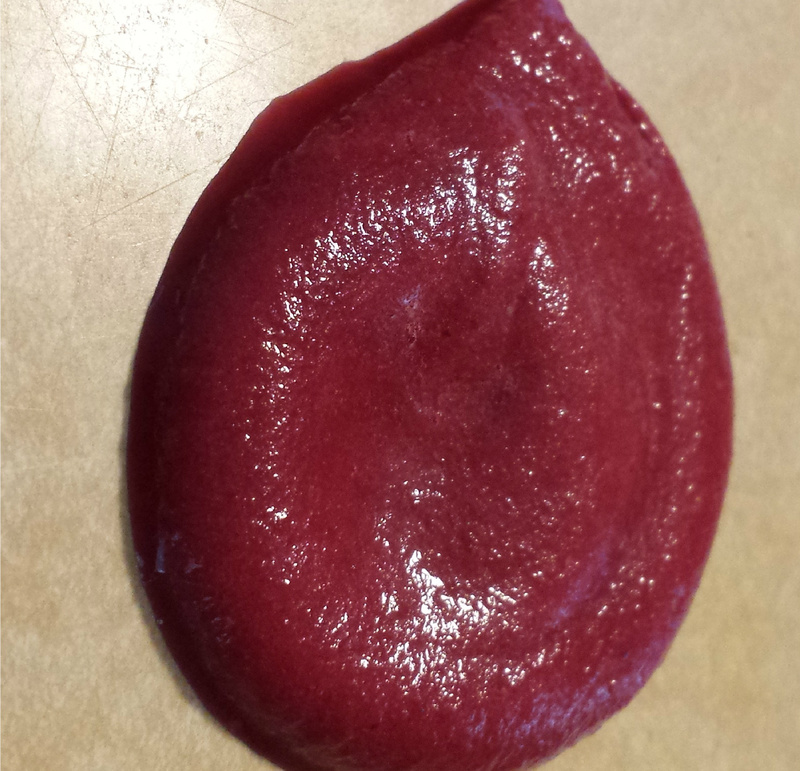 Roast or boil a beet just till it’s done (to preserve nutrients). Wash three or four organic apples, then chop. 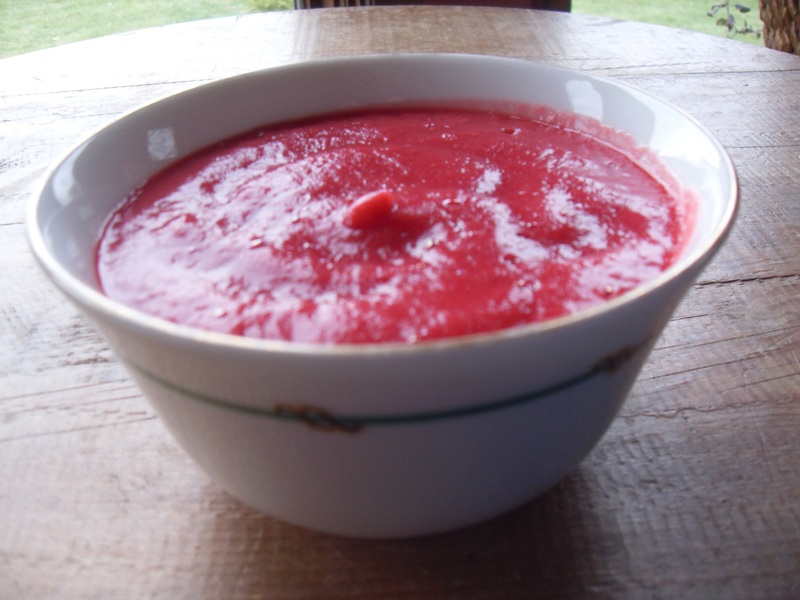 Toss apples and beets into a blender, whirling it all into a sweet fuschia delight. Keep blending till it’s smooth, or use a fine sieve for that purpose. For very young babies, probably under seven months, you may want to cook the apples a bit. I don’t. Since I use a Vita-Mix, I don’t peel the apples either. Blended long enough the whole concoction is perfectly smooth without any added water and doesn’t contain any bits of peel. I freeze this in ice cube trays, then let a cube or two defrost for an hour before Olivia’s next meal. Is give beets a chance. This entry was posted in appetizer recipe, baby food recipe, dessert recipe, eating, fermented recipe, kitchen arts, snack recipe and tagged appetizer recipe, baby food recipe, beet recipes, beets, dessert recipe, fermented recipe, kitchen arts. Bookmark the permalink. Or roast baby beets in their skins in the oven with chunks of carrot, pumpkin and sweet potato, drizzled with olive oil, sprinkled with rock salt and a little dried oregano… roasting concentrates the flavour wonderfully. Oooh, that sounds lovely. I’ve never roasted them in skins before. We have a huge crop of sunchokes, so we’ll be roasting them with anything on hand! 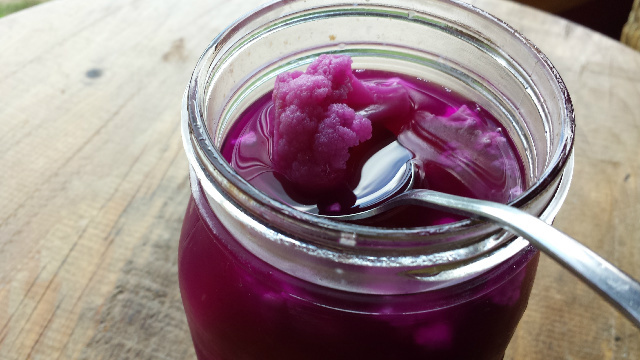 Hmm… Pickled beets and cauliflower sounds interesting (and delicious)! 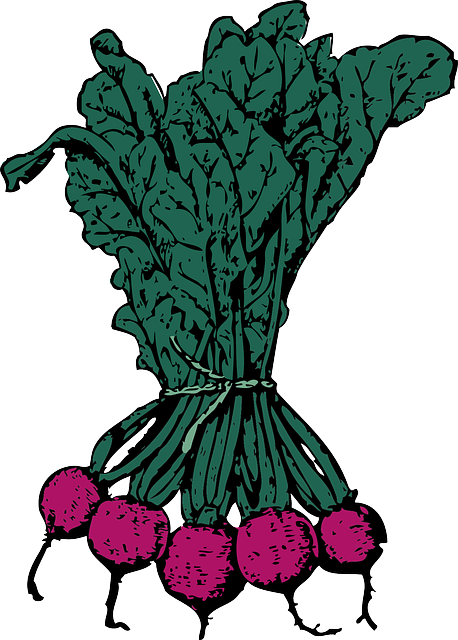 Beet greens are wonderful (and underrated in my opinion).